Please refer to our stock # 11AC42-241 when inquiring. Dennis Sheehan (American, born 1950) - Sunset on a Misty Pond. Oil on linen. Size: 24 inches x 30 inches. Unsigned, but purchased directly from the artist. Offered in a modern gilt wood plein air frame. 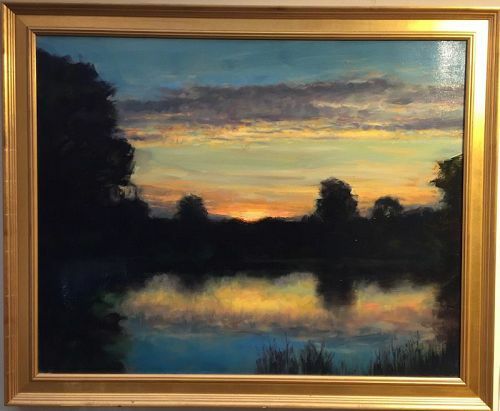 Dennis Sheehan is a contemporary painter of landscapes whose work is inspired by George Inness and other 19th century tonalists. His paintings are in many public and private collections, including the White House. He is a member of the Guild of Boston Artists and maintains a workshop in Manchester, NH. An unusually vibrant painting by Sheehan of a colorful sunset over a mist covered pond.